A must for many families. Pinching pennies includes clipping coupons. With the Internet, gone are the days when clipping coupons only came from your local newspapers or magazines. For some, coupons are purchased from auction sites. Some auction sites like eBay allow coupons to be sold on the auction block. I've never 'bought' a coupon as it almost seems like an oxymoron to me, but I guess one could still get a bargain by acquiring coupons that way. 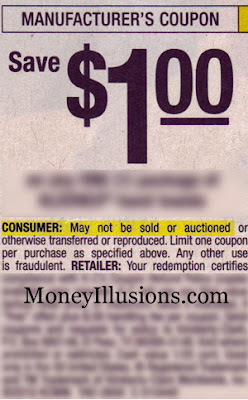 Some manufacturers prohibit their coupons being auctioned. Example: a coupon from one manufacturer getting their two cents worth in regarding the auction strategy; by prohibiting the auctioning of their coupons. Notice the coupon states, "May not be sold or auctioned, or otherwise transferred or reproduced." This manufacturer considers it to be a form of fraud if their coupons are auctioned.